In California’s northwestern corner lies the Prairie Creek Scenic Corridor, a patchwork of public and privately held lands surrounded by Redwood National and State Parks, home of the world’s tallest trees. The League and collaborators have been working toward a vision of protecting the corridor from development, reconnecting the parks’ ancient redwood groves, restoring prime wildlife habitat and creating an innovative visitor center. Earlier this year, the League completed an important step toward achieving this vision, transferring the 5.9-acre Berry Glen Trail Connection property to Redwood National Park. The transfer secures crucial habitat for Roosevelt elks and coho salmon, as well as the intersection of favorite hiking trails. In another important step, the League and California Trout recently received a grant from the National Oceanic and Atmospheric Administration to restore habitat for imperiled salmon at the confluence of Prairie and Redwood creeks. Learn more about our work in the Prairie Creek Scenic Corridor. Marking Latino Conservation Week, League President Sam Hodder writes about the joy he feels in sharing the spectacular redwood forest with everyone, including communities who have less opportunity to visit the outdoors. 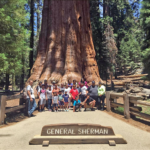 This year, a League-sponsored excursion introduced 20 young adults from the Los Angeles area to the magnificent Giant Forest in Sequoia National Park, home to five of the world’s largest trees. Learn more about why trips like these are so important. Save the Redwoods League thanks our community for responding to our call for public comments on what Giant Sequoia National Monument means to them. Comments from League supporters were counted among a record-breaking 2.8 million after the Trump administration ordered a review of certain national monuments.